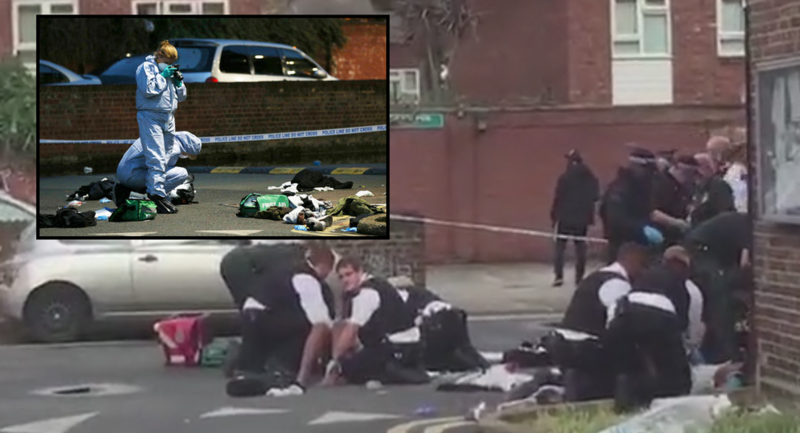 The crime spree that has gripped London to such an extent that it overtook New York in number of murders this year has another sad chapter to write today as a group of 30 youths from a housing estate in Camberwell, South London, were involved in a mass stabbing yesterday evening, leaving four children with life-threatening injuries and, to the horror of onlookers, one 15-year-old boy with his intestines hanging out of his belly. Related coverage: <a href="https://thegoldwater.com/news/33885-London-Car-Ploughing-Into-Cyclists-Being-Treated-As-Another-Terror-Act">UK – Car ploughs through crowd in another terror incident in London</a>. Oh the globalists and the MSM love this murderous gore. Its exactly what they intended to happen. They thrive on evil and hate, blood and murder. They are laughing and casting their bets, and probably watching on their own private street cams. They intend to get their new world order out of the chaos and suffering they inflicted on innocent people. They should all be eradicated from the face of the planet!!! 31Wherefore ye be witnesses unto yourselves, that ye are the children of them which killed the prophets. 33Ye serpents, ye generation of vipers, how can ye escape the damnation of hell? 35That upon you may come all the righteous blood shed upon the earth, from the blood of righteous Abel unto the blood of Zacharias son of Barachias, whom ye slew between the temple and the altar. 36Verily I say unto you, All these things shall come upon this generation. LAST DAYS WATCH AND PRAY!! Open borders is not a good idea demonrats! The british are going to half to fight for their country like their doing in Sweden. Vote red or watch America end up like these other open border countries! Those Damn Amish Children are at it Again!!!! Seems like all that "Diversity" is working!!!! !